Gear | Threads and threaded fasteners are seemingly such simple things, but they literally hold much of our modern world together. The first inventor of threads is not known for sure, but some sources say Archytas of Tarentum (428 BC-350 BC) used them in presses for olives and grapes. Threads are actually a type of wedge wrapped around a cylinder. The slimmer the wedge, (more threads per inch) the more force the thread can apply when turned. You have probably noticed that every trade has its secret language, and it will be helpful now to list some of the special terms used when speaking about threads. Later in this article you will find that certain types of common threads have been called by different names over the years. This is just part of the richness of our language, but it can be a little confusing at first. Nominal size: The designation used to identify the thread. For instance: 1/2-20, which is nominally 1/2 inch diameter. Actual Size: The actual measured size of a particular thread. Major Diameter: The largest diameter of a straight screw thread. This term applies to both internal and external threads. Minor Diameter: The smallest diameter of a straight screw thread. This term applies to both internal and external threads. Pitch Diameter: On a perfect straight thread this is the diameter where the widths of the threads and grooves are the same. Basic Form of Thread: The theoretical profile of the thread. Pitch: The distance from a point on one thread to the same point on the next thread, measured parallel with the axis. Lead: The distance a screw thread advances axially in one turn. In a thread with two “starts”, the lead will be twice the pitch. Angle of Thread: The angle between the sides of a thread measured in an axial plane. Flank: The surface connecting the root and crest. Fit: The closeness between two mating surfaces. Depth of Engagement: The depth of thread contact of two mating threads, measured radially. Craftsmen and machinists have long made threads of sizes, angles, and pitches that seemed right to them, but of course the various threads were not interchangeable. Even as late as 1930 there were over 30 different thread standards in use. Here in our town the saddlemaker uses Landis, and Champion sewing machines, and many of the screws and bolts on them have unusual sizes and pitches. When he needs new screws and bolts on the machines, I often have to use my lathe gearing to cut the odd pitches. We take it for granted today that we can buy, for instance, a 1/2 inch coarse thread bolt from any supplier, and it will fit properly any 1/2 inch coarse thread nut from another supplier. This interchangeability is a relatively modern development spurred in some measure by the needs of war machinery. The brilliant British engineer, Joseph Whitworth, (1803-1887) devised a thread system in 1841 that was adopted by the British railways, and soon by other industries. Called the Whitworth Thread, it has a vee form thread with 55 degree angle and rounded crest and root. The Whitworth Thread is still in use today, and if you have older British cars or motorcycles you will be familiar with it. The Whitworth Thread system is the basis of the U. S. National Standard and Unified National Standard Thread, and all sizes and pitches are the same through 1-1/2 inches, except for the 1/2 inch size where the US uses 13 threads per inch instead of 12. In older books you may see references to the Sellers or Franklin Institute Thread. William Sellers in 1864 proposed the 60 degree angle and the other specifications that were adopted in the United States as our standard thread. The Franklin Institute, of Philadelphia, appointed a committee in 1864 to investigate and report on screw threads, and they recommended adoption of the Sellers thread. Over time the Sellers vee form Thread was modified very slightly in some dimensions, and it became the United States Standard Thread or the National Standard Thread. The United States Standard Thread was approved for use in the United States naval service in 1868, and in 1871 the Master Car Builders’ Association recommended it for construction of locomotives and railway cars. Manufacturers throughout the United States soon recognized the advantages of the National Standard Thread, and its use spread widely. Later, the National Standard Thread was re-named the Unified National Standard Thread, and it was adopted in 1948 by America, Britain, and Canada to eliminate confusion of threads used on war equipment. The Unified National Standard Thread has a thread angle of 60 degrees instead of the 55 degree angle used on the Whitworth thread. Mechanics have been known to mix Unified and Whitworth fasteners, but this is an unwise practice, since the thrust surfaces of the mismatched threads have different angles. Note also that the Unified Thread has crests and roots that are flattened, while the Whitworth has rounded crests and roots. The Whitworth form is greatly superior in fatigue strength, and we will discuss why a bit later. Three dies. Metric, standard and British Standard. Dies are used for cutting threads on round stock. Although the 60 degree thread angle of the U.S. and metric systems is the most common one, other angles have been used for vee form threads. The Lowenherz Thread uses 53 degrees 8 minutes, and the Swiss Thury and the British Association Threads use 47 - 1/2 degrees. A ‘Jewelers Thread’ used even today for precious metals such as silver, gold, and platinum has a thread angle of 80 degrees. The Whitworth standard once so common in England and its colonies has been largely superseded by the Unified National Standard, although untold numbers of older British vehicles and pieces of equipment still need Whitworth and British Standard Fine fasteners to keep them repaired. In the American and English systems, threads are typically specified by the major diameter and the threads per inch: for example, 5/8 inch-11. The Metric system uses major diameter and distance between threads (pitch): for example, 10 MM X 1.25 MM There have been several different metric standards used by various European countries over the years, but the main one today is the ISO (International Organization for Standardization) Metric Thread. It has a 60 degree thread angle with flattened root and crest, and is of course in metric sizes and pitches. There are some unusual threads that mix both metric, and threads per inch; for example: “Italian” bicycle threads have 36 MM diameter X 24 threads per inch for bottom brackets, and 2.2MM diameter X 56 threads per inch for spokes. The Whitworth thread is fairly coarse in pitch, like our own Unified National Coarse series. The British Standard Fine Thread is the same form as the Whitworth but with finer pitch. Our fine thread system is the Unified National Fine (often called the S.A.E. after the Society of Automotive Engineers, and its wide use in automotive applications). Coarse threads on bolts must be cut deeper into the bolt material than fine threads, and the root diameter of the bolt is smaller, and thus weaker. Fine thread fasteners are usually superior in strength and more resistant to vibration. Coarse threads are used for good grip in soft materials like cast iron and aluminum, and for rougher sorts of work. Studs used in automotive and aircraft applications often have coarse threads on one end for good grip in the softer types of engine metals, and fine threads on the other end for better grip on the harder steel nuts. It is always desirable to use standard thread systems whenever possible, but for special needs there are Unified National Special threads; Unified National Extra Fine, and other unusual sizes and pitches that you will not find at your corner hardware store. Machinery’s Handbook and other trade manuals list the specifications of the many thread standards in use today. I recommend High Performance Hardware: Fastener Technology for Auto Racers and Enthusiasts by Forbes Aird as a superb book to help you understand fastener design and application. A group of taps. These tools are used to cut threads in holes. Years ago some interesting size variations based on standard thread systems were developed. In the early 1900’s many American companies produced threading tools that were 1/64 inch or 1/32 inch larger than, and also smaller than, the National Standard Thread size. Taps and dies for these unusual sizes were still in use in the 1920’s, but are seldom encountered today. Having threads that are slightly larger than standard allows easier repairs when threaded holes become worn. In the 1840’s the Holzapffel Company in England had several sizes of their own special thread standard in order to be able to refurbish worn machines and equipment of their own make. Both the British and American systems have special standards for smaller screws below about 1/4 inch diameter. Americans use a gage number for the diameter of the thread, followed by the number of threads per inch. You may be familiar with # 6-32 screws used to secure electrical switch plates in your house. Gage numbers readily obtainable today run from the tiny #0 size (.060 inch diameter) through number #12 (.216 diameter), and there is a coarse and fine thread standard for each size. There are even uncommonly used sizes of 00-90, 00-96, and 000-120 threads per inch. In the American system, the bigger the gage number, the larger the diameter. In earlier years the range of machine screw sizes was much wider than today. In my grandfather Ralph Cole’s 1916 copy of the Mechanical Engineers’ Handbook there are listed machine screw specifications up to # 30 (.4526 inch diameter). Henry Ford used the #14 size for brass screws that hold magnets to the flywheels of his famous Model T cars. Sizes above #12 are obsolete today. My friend Kim Pisor gave me set of old threading dies that belonged to Jack Renault, the brilliant machinist and founder of Gabilan Iron and Machine in Salinas, California. Included are dies to cut #14-20 and #14-24 threads. There is even a die to cut a # 11-24 thread: an odd size I had not seen before. Years ago some small screws below 1/4 inch diameter were specified in fractional sizes. I have a tap and die set that was my grandfather’s, and it has sizes like 7/32- 24 and 3/32-48. I have other dies to cut 15/64 –32, 17/64-32 and 1/16-64 threads. These sizes are obsolete, but if you are working on older items you may find such a set very useful. The British use another system for small screw sizes; called the British Association Thread. It has a 47- 1/2 degree thread angle with rounded crest and root, and is specified by a single number: for example, 2 BA (which is about the same size as the American # 10 size). The BA size designation is just the reverse of the American system: the bigger the number, the smaller the size. Thus, 16 BA is smaller the 2 BA. There were many British Association screws on our 1934 Rolls Royce. The British Association thread was made obsolete in 1966, but it is of course widely used for repairs on older British equipment. For extremely small sizes used in instruments, watches, and other miniature mechanisms, America has the Unified Miniature Screw Thread ( UNM ) with diameters down to .300 millimeter ( .0118 inch ): this small size has 317-1/2 threads per inch. Europe has watch and instrument screws too of course and uses the metric system. In earlier times various watch companies in the United States and Europe had an interesting variety of their own screw thread standards. Vee form threads are the most common in fasteners today, but there are other thread shapes that have advantages for certain applications. I think you can see that when you tighten a vee form nut, the angle of the thread produces a force trying to expand or burst the nut. For very high loads, a thread with no angle or very small thrust angle is often superior. The square thread has been widely used in things like early coining presses, vises and other high load applications. In older mechanical manuals you may find reference to the Sellers Standard Square Thread; named after the same William Sellers who long ago set the specifications for the American standard vee form thread. Square threads were used to hold the barrels in many American service rifles, including the famous Springfield 30-06 bolt action rifles used in WW I and WW II. Square threads are difficult to machine accurately, and have been largely superseded by the Acme thread which has an angle of 29 degrees. The ends of taps are tapered so they start in the hole easily. Some taps are cut without the taper so they will cut threads all the way to the bottom of the hole. Acme threads are easier to cut, and can carry high loads. Very accurate Acme threads are often used as ‘translation’ threads for applications like lead screws in lathes, milling machines, thread grinders, and other precision machinery. The Proto Company changed from vee threads to acme threads on some of their gear pullers years ago in order to gain greater strength. For certain special applications where a coarse but shallow thread is needed, the American National Stub Acme Thread is available. The term ‘stub ‘ means a shallower than usual thread. There is also a 60 Degree Stub Thread of vee form for applications such as tubing, where a normal depth thread would seriously weaken the thin wall. Another variation of the Acme Thread is the Worm Thread, which has a 29 degree angle, but is cut deeper and is designed for use with worm gears. Buttress threads have a square or almost square thrust face and are angled on the back side. They can take high loads, but only in one direction. I have seen buttress threads with undercut thrust faces used on drill press vises. The undercut grips tightly in a half nut, but can quickly be lifted out of the nut when loosened. Pipe threads usually serve two functions: they secure the fittings together, and also seal tightly against fluid pressure. Tapering the thread diameter 3/4 inch per foot makes it easy to achieve leak proof joints. Straight cut pipe threads are used in applications like electric lamps, where sealing in not needed. Formerly known as the Briggs Thread, the pipe thread used in America is the American National Standard Taper Pipe Thread. Britain uses the British Standard Pipe Thread, which has the Whitworth thread form. British pipe threads are different and should not be interchanged with American Standard pipe threads. British Standard pipe fittings are often available from bigger supply houses in America. Some pipe threads have very steep tapers so the joints will come apart with just a few turns. Well drilling pipe often has this type of thread, and I have also seen cannon breeches with interrupted steep tapered threads. An interrupted thread has longitudinal sections of the thread removed on both male and female parts so the pieces can slip together and be tightened with a partial turn. Take-down barrels of rifles and shotguns often have interrupted threads. Helical inserts, commonly called Helicoils (Registered name), are coils of wire with vee form threads on the outside and inside. They are commonly made of stainless steel or phosphor bronze, but stainless is more commonly seen. Helicoils are often used to restore stripped female threads, but they are also installed new in soft metals, and even wood, to provide a long lasting thread. Damaged threads are drilled out and the hole is tapped with a special size tap. The swelled-up coil spring type insert must be compressed with an insertion tool and screwed into the tapped hole. The expansion force of the insert keeps it in place in the hole. Round or knuckle threads are widely used on light bulb bases and also on fasteners that must endure extremely rough handling and dirty conditions; such as around concrete, and on rock drills. There are many niche industries that have long used special thread standards for things like watches, microscope lenses, power pole insulators, fire hose couplings, compressed gas fittings, etc. Many of these special threads are still in use today, and the specifications of them can be found in Machinery’s Handbook and other mechanical reference texts. I have long been interested in obscure threads and fasteners, and have a framed collection of nearly three thousand items ranging from a Roman bronze nail, to modern high tech aerospace fasteners. Two interesting but now obsolete thread systems are the Aero, and the Dardelet. The Aero thread was developed in the early 1940s for high vibration applications on aircraft where fasteners with vee form threads had been breaking. Aero Thread bolts and screws have round bottom threads that mate with coiled wire-type inserts made of bronze or stainless steel. The coiled wire inserts have rounded threads on the inside and vee form threads on the outside for good grip in soft aluminum, and magnesium alloys used in aircraft. The Dardelet self-locking screw thread was patented in 1936 and has a 29 degree thread angle like the Acme thread, but the threads have axial play, and the root of the bolt and the crest of the nut have a 6 degree taper. This allows the parts to screw together easily until seated, then the parts shift slightly as the nut is tightened, and the tapered surfaces wedge tightly together. Dardelet threads have a coarse and a fine series. Joseph Whitworth was years ahead in his design having radiused thread roots. Earlier I mentioned stress failures in vee form threads, and the main reason was cracking that started in the sharp corners at the roots of threads having the National Standard form. Whitworth bolts with their radiused roots have much greater fatigue strength, but making the tools to cut the rounded surfaces is more difficult than with the National Standard form having flattened roots and crests. For many applications the National Standard form is fine, but when loads get really high, especially loads that alternate from high to low, (engine connecting rod bolts for instance) any sharp corners tend to act as stress raisers, and bolts fail. This is especially true for harder and stronger bolt materials. Smart engineers realized that a smooth radius at the thread root would increase fatigue strength, and a thread form called the ‘R’ thread was developed and widely used for aerospace fasteners and other critical applications. It was so successful that the radius was increased a bit more to a form called the ‘J’ thread. 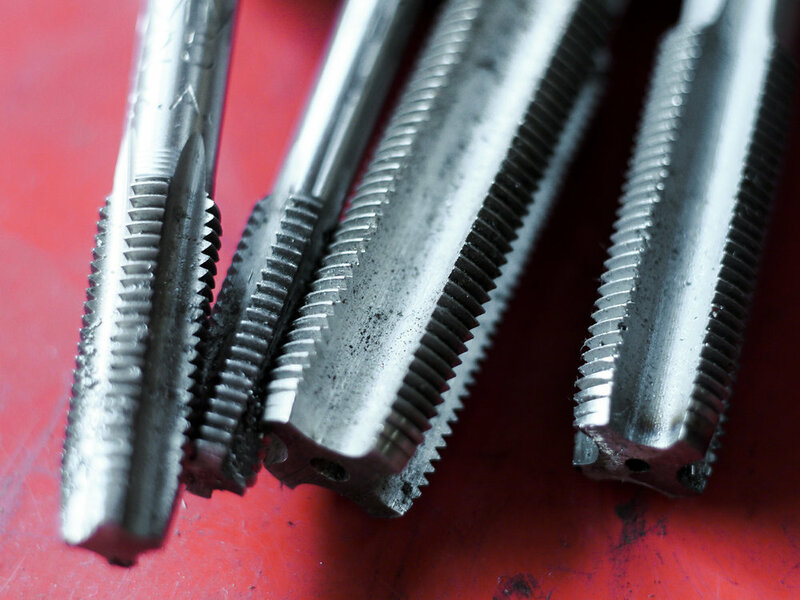 The difference between an R thread and J thread is nearly invisible, but the greater radius of the J thread allows highly stressed bolts to live about 6 times longer. Most highly loaded bolts used in aerospace and automotive applications today have the J form thread, and the threads will be formed by rolling. Threads can be made in many ways. The earliest exterior metal threads were probably filed by hand. Later, various types of dies were made to cut threads, but these tend to tear the metal, and it is hard to get accurate pitch over any length with dies. Dies are of course still used today for short, low precision thread cutting. Lathes were (and still are) used with hand held tools to cut short threads for things like screw tops on wood containers, but it is difficult to control the pitch of the threads with hand held tools. Antoine Thiout about 1750 used a lathe with a screw drive on the carriage, and Jesse Ramsden by 1770 was making precision screws with his lathe. A precision machine lathe can cut just about any thread form and pitch by using gears and a lead screw to move a single point tool at the proper rate. Multiple passes are made with the lathe tool, taking light cuts each time. At a microscopic level there is some tearing of the metal surface because the tool is standing still. Wearing of the tool tips also makes it hard to maintain precision thread form. For very accurate screws like those needed on micrometer spindles and lead screws, precision thread grinders are used to cut threads in hardened steel or other materials. Some materials, like tungsten carbide, are so hard that grinding is the only practical method of forming threads. The process of hardening steel produces warpage and changes in dimension that grinding can correct. Some threads are ground “from the solid” in hardened metal, and others are roughed in by other means, hardened, then ground to final form and pitch. For very coarse threads, milling machines with rotating cutters can be used to cut threads with precision and speed without seriously tearing or over-stressing the metal. Milling can be used on external threads, and also on internal threads of diameters big enough to allow a milling cutter inside the hole. Today most bolt and screw threads are made by rolling blanks between grooved circular or flat dies. The blanks are approximately the pitch diameter of the thread. 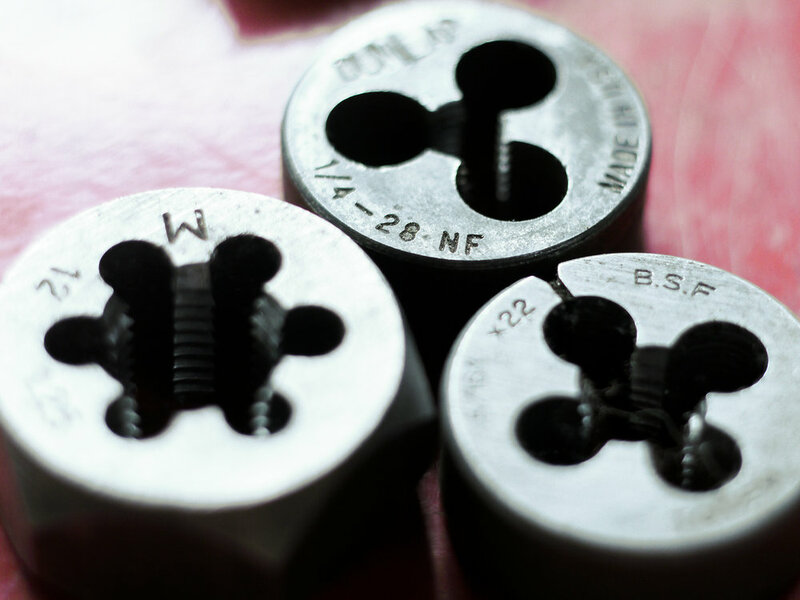 The grooves in the dies have the shape of the thread profile, and press the threads into the metal without removing any chips. There are several benefits of rolling: the process is very fast; no chips are produced, meaning less metal is needed to make the finished product; and most important, the cold working of the metal produces high strength threads. The grain of the metal is forced into the shape of the threads, and the cold working strengthens and hardens the metal. Rolling works well with vee form and even Acme form threads. For certain very high strength bolts the threads are sometimes rolled after hardening the blanks. This develops compressive loads in the bolts that helps them resist fatigue failure. Rolling hard material is tough on the rolling dies, and therefore expensive, but for very critical applications the gains in strength are worth the trouble. Rolling works especially well with vee form threads having radiused roots, and as we discussed above, the radius shape improves bolt strength and resistance to fatigue. Internal threads of smaller sizes are usually cut with ‘taps’ that are screwed into predrilled holes of the correct size. The ‘tap drill‘ leaves the correct amount of metal for the threads. This is often about 75% of full thread depth because tapping full depth threads require high torque, which breaks a lot of taps and produces threads that are not much stronger than shallower threads. Most taps have flutes [grooves] and sharp teeth that cut the material to shape and remove chips. There is a special type of forming tap that has no flutes, and presses the threads into metal. These fluteless taps must have exactly the right size hole drilled first, and must be properly lubricated. In certain metals like non magnetic stainless steel, and copper alloys, that work-harden rapidly, fluteless taps produce threads that are stronger and harder than the parent metal. Most threaded items have a single thread, or “start”, but it is possible to put multiple threads side by side on a piece. At first glance a multiple thread looks like a single thread, but it has multiple ‘starts’. Multiple threads screw in rapidly: my fountain pen cap has four starts and tightens with only 3/4 of a turn. A disadvantage of multiple threads is that the high lead angle thread tends to loosen easily with vibration. Some ‘deck’ screws used in wood have multiple threads for fast insertion. 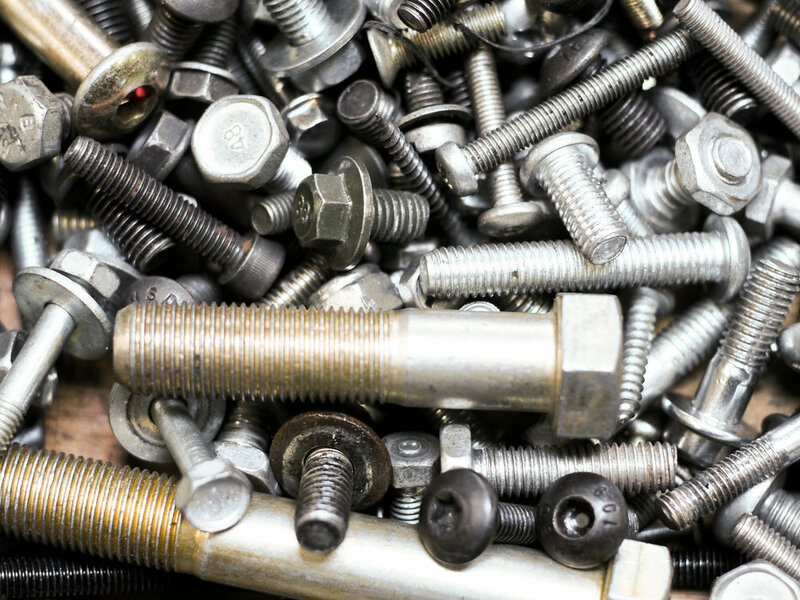 Deck screws, wood screws, and lag bolts are examples that use threads spaced widely apart in order to give good grip in soft materials. There are a variety of modern screws designed for wood and particleboard, having thin shanks and aggressive self tapping thread designs that minimize splitting, even when holes are not pre-drilled. 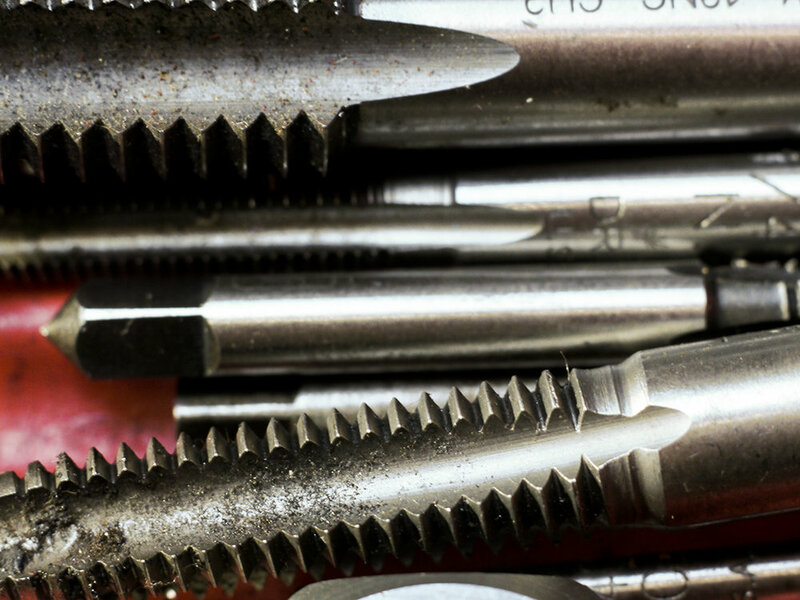 Many sheet metal screws have thread shapes similar to wood screws and can be used in wood, plastic, and other soft materials, in addition to sheet metal. Drive Screws have threads with very rapid leads, and are designed for driving into holes with a hammer. They work in metal as well as softer materials, and are commonly seen holding metal labels to machinery. Left hand threads can be useful for applications such as the wheel nuts on the left sides of automobiles, where the rotation of the wheels tends to keep the nuts from unscrewing. Dodge cars and trucks have used left hand threads for wheel nuts. For turnbuckles and certain clamps, left hand threads on one end of the screw, and right hand threads on the other, will draw the parts together. Threads are wonderful things that help us daily, and I hope this article may increase your knowledge and appreciation of them.